Automotive glazing services provider Auto Windscreens has confirmed its sponsorship of Jason Plato in the 2009 HiQ MSA British Touring Car Championship (BTCC). The recent sponsorship deal with Auto Windscreens has enabled Plato to confirm a full-season programme in the 2009 BTCC. Eight dates now remain in the season, which finishes on 4 October 2009 at Brands Hatch GP. Plato currently stands in fifth place following the second round of the HiQ MSA British Touring Car Championship, held at the high-speed Thruxton circuit in Hampshire on 26 April. Auto Windscreens’ sponsorship has come at a critical time for Jason. SEAT pulled out of BTCC at the end of 2008, leaving Jason without a drive for the 2009 competition. 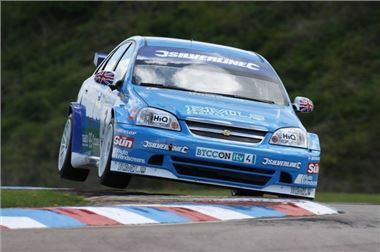 In a dramatic late entry, Plato took part in the opening round of the BTCC 2009 on 5 April in a privately-entered RML Chevrolet Lacetti, thrilling the crowds with a 100mph completely broadside 'save' on Paddock Bend. Jason will complete the season under the team name of Racing Silverline. The blue Lacetti looks very like the blue Lacetti 'Reasonably Priced Car' driven by a star on BBC Top Gear. Plato now hopes to add a second BTCC crown to the one he secured in 2001. In the 2008 BTCC Plato finished third in the BTCC Drivers’ Standings. Jason Plato is one of the BTCC's most successful racers, having won 46 times in the series and is also one of the sport's most popular characters, thanks to his extensive work in motoring-related TV programmes. Plato made his BTCC debut in 1997 driving a Williams-prepared Renault Laguna team alongside Alain Menu. The 41 year old, from Oxford, started his racing career in Karts at the age of 12 and lifted his first championship title in 1982 for winning the British Karting Championships. From here on Plato would go on to win titles in the Formula Renault Euroseries, the Renault Sport Spider Cup and the coveted British Touring Car Championship.